Hermosa Beach is an affluent beachfront city in Los Angeles County, California, United States. The city is located in the South Bay region of the greater Los Angeles area and is one of the three Beach Cities. Hermosa Beach is bordered by the other two, Manhattan Beach to the north and Redondo Beach to the south and east. The Hermosa Beach Chamber of Commerce was established in 1912 and has been an integral part of the business community for over 100 years. It is known for sunbathing, beach volleyball, surfing, paddle boarding and bars. The city itself extends only about 15 blocks from east to west and 40 blocks from north to south, with the Pacific Coast Highway running down the middle. Hermosa Beach has an average of 325 days of sunshine a year because of its location which nestled on a vast open bay (Santa Monica Bay), morning fog and haze is a common phenomenon in May, June and early July (caused by ocean temperature variations and currents). Locals have a particular terminology for this phenomenon: the “May Gray” and the “June Gloom”. Overcast skies are common for June mornings but usually the strong sun burns the fog off by noon. It sometimes stay cloudy and cool all day during June even as other parts of the Los Angeles area enjoy sunny skies and warm temperatures. The rainy season is from late October through late March. Winter storms usually approach from the northwest and pass quickly through the Southland. There is very little rain during the rest of the year. The wide flat beach makes Hermosa Beach one of the most popular places to play beach volleyball from professional to amateur. 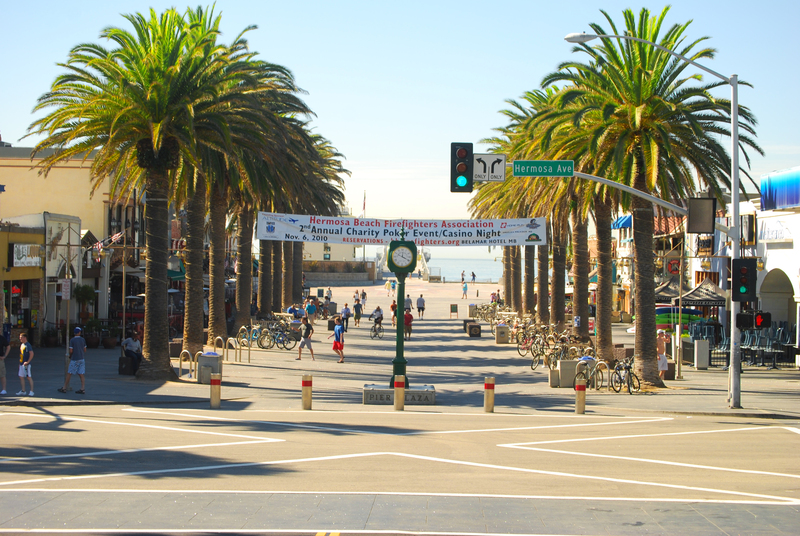 Hermosa Beach is home to the AVP Hermosa Beach Open tournament and several amateur CBVA tournaments during the year. The Strand stretches north into Manhattan Beach and south into Redondo Beach and is a popular place for walkers, joggers and biking. Of the three Beach Cities, only Hermosa Beach owns its own beach.